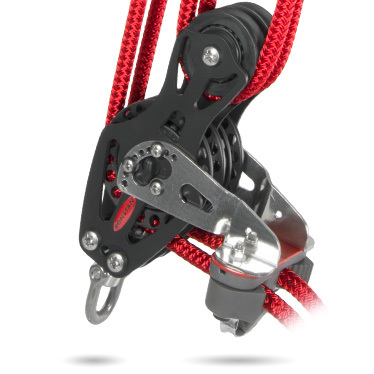 Two-speed mainsheet systems allow both coarse and fine tuning in a single purchase system. The system allows fine tuning of the mainsheet when sailing upwind by using one of the sheet tails and keeping the other cleated. Using both the sheets at once allows the trimmer to blow off the main quickly when rounding the top mark and trim on quickly when hardening up after rounding the bottom mark. When fitting to traveller cars, ensure adequate support for the bottom block and use stand-up spring kit RF324-1 or RF324-2. (Refer to traveller section for more information).